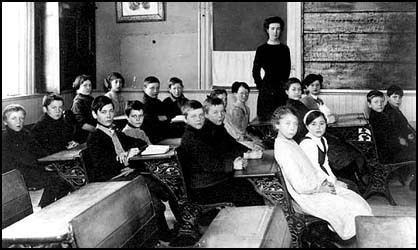 By the time these pictures of the Hilton Schoolhouse and class were taken, Norwood was already a thriving community. Fueled by the logging industry the village of Norwood had an extensive dock installed where freighters would stop to "wood up." Sawmills ran around the clock and the village grew. By the early 1900’s, Norwood boasted mills, boarding houses, a store, and hotel named the "Eagle House." The first postmaster, William Harris established the post office in 1867 and remained busy for years to come within the same time period Orwin Adams platted the village of Norwood. The growth surrounding the logging industry continued at a robust pace and as the communities grew churches and cemeteries were built. 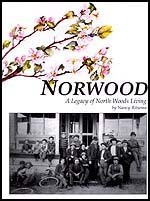 Norwood even had a barbershop where the hard working men would often gather to solve the world’s problems. $24.95 The village was moving at such a rapid pace they even had a village band complete with a bandstand of sorts. Actually, it was a windmill built by the Ferguson family in the late 1800's. It housed a well and supplied water for the family home. The landing near the top of the windmill was where the band would set up and perform weekly concerts during the summer months. The concerns of the day were not that different than they are today. 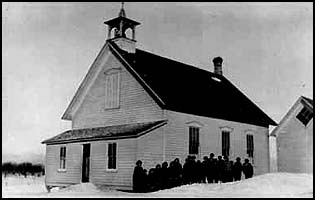 Schooling the children of the community was an issue of priority and the boom of building schoolhouses was well under way throughout our country as well in our little corner of the planet. Since the children mostly walked to school the buildings spotted the landscape every few miles which is why there are so many of these lovely old structures around today. Many were turned into homes, some turned into antique stores and shops. It seemed like a logical thing for the Bier's to transform the Hilton schoolhouse into an Art Gallery. The old building continues to bring smiles to those who enter through its doors today in much the same way the sense of the joy of discovery and learning did so long ago for another generation at another time. Students: Orvil Hilton, Myron Hilton, Frank Cook, Emma Klusak, Marie Klusak, Alice Jones Heise, Catherine Hartwell, Bob Jones and Burt Jones.